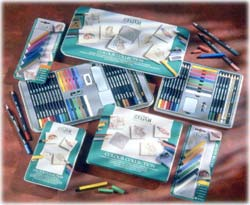 With a set of W&N Derwent COLOR pencils 12CLR Studio, artists will have an entire range of rich sketching utensils to use at their fingertips. Ideal for a variety of different materials and projects, from simple sketches to complex layered pieces, the discerning artist keeps several boxes of these pencils. Richly diverse in color, at least one set of W&N Derwent COLOR pencils 12CLR Studio is a necessity in every serious artist's studio. Many artists, however, have several sets so they always have one at the ready, no matter where they might find themselves sketching These high quality pencils have a broad range of colors that make them well suited for any project an artist might have. Designed to be smooth and easy to blend, these pencils feature a hexagonal barrel that make them easy to grip. Once sharpened to a fine point, they are long lasting and do not crumble under extended periods of use.